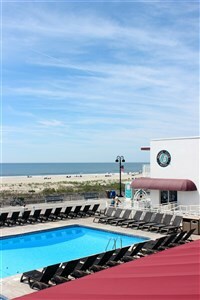 Join Perkiomen at the Beach Club Hotel in Ocean City, New Jersey. Come unwind in the surf and sand! On the boardwalk and overlooking the Atlantic Ocean, the Beach Club has an ambiance unlike that of any other hotel in Ocean City. Here you'll be welcomed with warmth, taste and style in a spirit of uncomplicated hospitality. With a beachfront pool, sun terrace and a top rated restaurant offering unequaled ocean views, the Beach Club provides an extraordinary vacation. And if variety is the spice of life, then the diversions you'll find at the Beach Club makes this the hottest of spots. If you're looking for activities, Ocean City has plenty to offer with fishing and crabbing, boat tours, water sports, golf, bird watching, shell museums, wineries and more. Ocean City's Boardwalk is just steps away. A stroll on "the boards" is one of the oldest past times on the island with sections of the boardwalk dating back to 1880. The 2.5 mile boardwalk is lined with beautiful beachfront homes, unique shops, amusements and eateries that can be enjoyed on foot or on bicycle in the morning. The family friendly beach is just steps away from the hotel for relaxing in the warm sunshine. Today we will travel directly to Ocean City, New Jersey to make the most of the beach and boardwalk. Our lodging for the next two nights will be at the Beach Club Hotel. Just steps from the front door are Ocean City's famous boardwalk and beaches. This afternoon when our rooms are ready*, we will check-in. Your entire day will be free to enjoy Ocean City as you please. Enjoy a morning stroll, a day of shopping or exciting amusements in the evening. If relaxation is your goal, stretch out in a beach chair or splash in the surf and build sandcastles at the water's edge. This morning you will be free to run back to that favorite shop on the boards or catch a few more rays. We will leave Ocean City by early afternoon. *You will want to pack your beach clothing in a carry-on bag, separate from your other luggage. This will eliminate confusion upon arrival. Since we plan to arrive in Ocean City early in the day, all of the hotel rooms will not be ready for us immediately.